With the help of goats, cows, and pigs of course! Step 1 – Bring cattle and goats in to overwinter where we want a large garden next summer. Done. Step 2 – Let them eat hay in that area to keep them off fragile winter pasture. Done. Step 3 – When the cattle and goats poop, cover the manure with bedding. Done. Step 4 – Let them trample the oxygen out of the bedding/poop mixture to preserve it. Done. Step 5 – When the grass starts growing, move cattle and goats to pasture. Done. Step 6 – Bring in some young pigs. Done. Step 7 – Allow pigs to till up the manure/bedding mix and turn it to compost. In progress. Step 8 – Once everything is composted, remove pigs, rake smooth, and plant. In future. Step 9 – Have a barbecue. In future. It may sound like a lot of work, but it keeps our pastures from getting pugged up and muddified in the soggy wintertime, lets us put all that manure and wasted hay to good use, lets the animals do all of the work to prep the garden rather than the farmer or the fossil fuel equipment, and keeps the animals going and growing while they work. 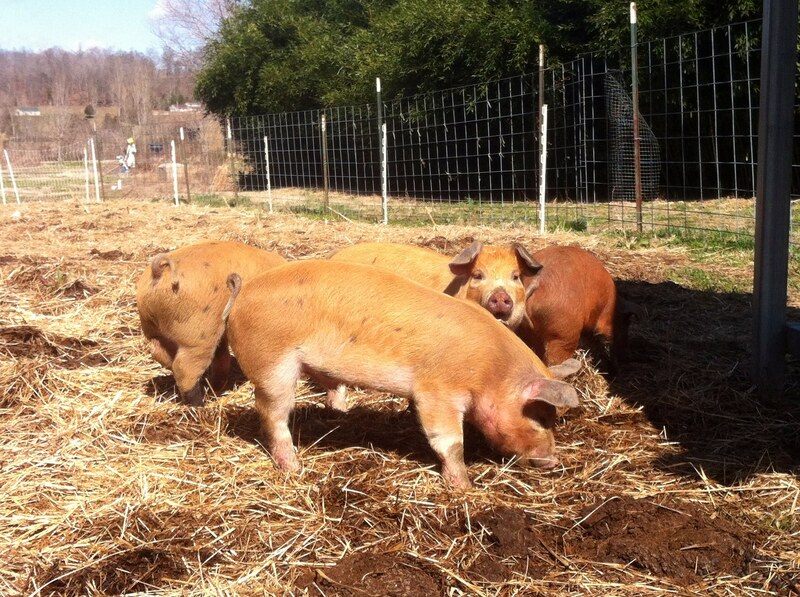 So without further ado, please allow me to introduce GLR’s newest residents – the pigs! Pigs starting to explore their new environs. These four strapping young fellows came with me from Bloomfield this morning from another farmer who thinks like we do – no antibiotics, hormones, steroids, nose-ringing, etc. They are a cross between a Duroc sow and a Gloucester Old Spot boar. Both varieties are known for having great meat quality. 3 of these boys are light red/orange with some black points and spots while the other looks like a straight-up dark red Duroc. That last one is the smallest at about 45 pounds while the rest are over 55 pounds. They are seven weeks old and have lots of growing to do while they prep our garden ground for us! Nature’s plow at work. These little guys are solid muscle. 50 pounds packed into a real small space. Scooter thought we brought him new friends. He was quite intent on playing with the pigs, but we convinced him that wasn’t such a good idea. And contrary to popular mythology, the little pigs did not go “wee wee wee” all the way home. Geoff you should build a Smoke House. To Cure Bacon ahd ham and to Smoke Pork Ribs. Love it Great Job!! !